What could be more exciting than the end of the school year? For many students, the answer is graduation season. May and June mark the end of one chapter and the beginning of another in many families’ lives. And paper is there every step of the way, even in this digital world. That scene just doesn’t work, does it? In fact, if that were real life, you’d probably feel the same as the college students interviewed in this video, for whom the idea of a digital diploma is unacceptable. 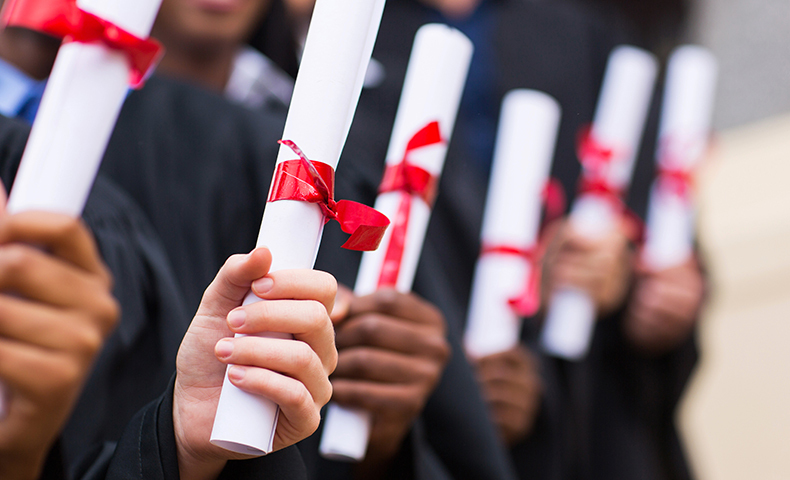 Paper plays a major role in every student’s life during graduation season. It’s in the programs handed out to students and families at end-of-school award ceremonies and graduations. It’s in the greeting cards and beautifully wrapped presents that celebrate this scholarly achievement. It’s in the decorations at parties and receptions. And of course it’s there in the classic diploma that proves you’re ready for the next big adventure in life. These tangible reminders of graduation season quickly become special keepsakes and valuable records of a life well-lived. It’s a safe bet that many of your prized possessions are printed on paper, whether it be a beloved photo album, a child’s birth certificate, a postcard from a loved one or a childhood baseball card or comic book collection. Paper mementos are among our most treasured possessions. Digital media might be playing an increasingly important role in everyday life, but it can’t replace the permanence of paper. Paper helps deliver some of the most definitive experiences in our lives. While the medium itself may become worn or damaged and the ink may fade over the years, handwritten letters, printed photographs or college diplomas won’t be lost to hackers, a hard drive failure or an outdated operating system. The very fact that these keepsakes are printed allows us to enjoy them for as long as we want, whenever we want. We understand why many people have considered going paperless. But it’s worth remembering the long-term benefits of including paper in our lives. And it’s also worth noting that not all papers are created equal. When you buy paper made from responsibly managed forests, you’re actually helping to preserve forestlands while you preserve memories — during graduation season and for all of life’s special moments — for many years to come.